Najlaa chose to talk about one of a set of two quilts which she calls ‘Piece for Peace’. She made the touchstone object to tell people about her homeland of Iraq, exploring the culture, history and her personal memories, as well as charting the history since the 2003 invasion of Iraq. 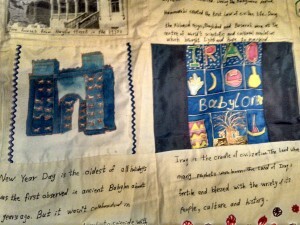 The second quilt, which she also discusses, was made by other people as a response to her theme ‘Piece for Peace’. 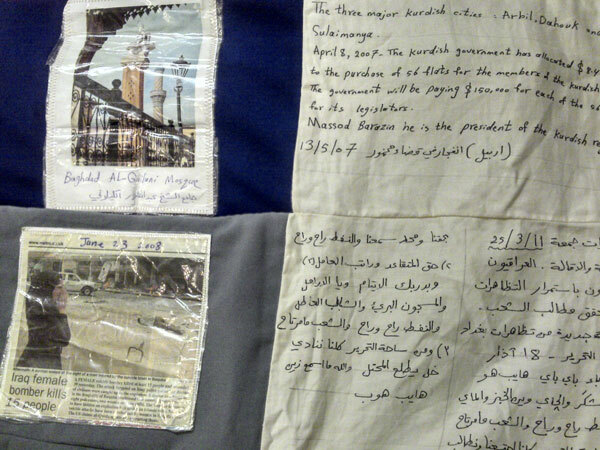 Najlaa’s quilt incorporates photographs, magazine clippings, embellishments, embroidery and handwritten words (including several Arabic poems). She also talks about her personal journey initially working as a Maths and Physics teacher in a mixed secondary school in Iraq, to teaching textiles in adult education classes in London. AS: On Friday 23rd January 2015. So Najlaa, you’ve brought this quilt out, could you tell me again what you said when you brought it out and what this quilt is about? 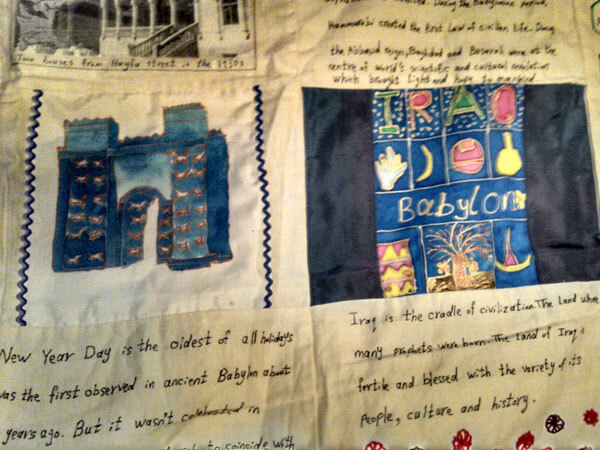 NK: This is a quilt I started after 2003, about Iraq after the invasion of Iraq. I used to teach with many women groups and they… many of them they ask me ‘What is in Iraq? There just the oil, and the terrorist and there is nothing in Iraq’. I shocked to hear that, and I said ‘no, we have our culture, we have old history and many thing in Iraq’, they kept quiet. 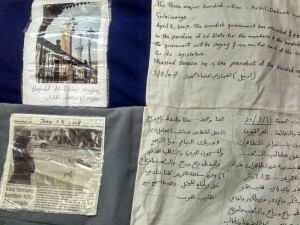 After that I return home, thinking, how can I do something about Iraq as a wall hanging or a quilt? I started to draw a map first, on my quilt, and stitch simple stitch the Iraqi map first [crinkling noise in background starts], then, after that, about the museum of Iraq, about Babylon and Ishtar Gate and about some culture like jewellery in Iraq about palm tree, and I used embroidery, I used fabric paint, I used silk paint, I used writing in Arabic and English, some er, poems, I can’t interpreter them, I used… I write it as, in Arabic. And er, then, I abandoned it, because I feel so upset about different developments in Iraq, then explosion in Iraq, it make me sad, I stopped. I, after, after a while I told my friend, I wish I make something about Iraq, and they said to me, yes, let us do something about Peace. Then I cut fabric, and I said, please take this square of fabric and do for me any message about Iraq. Now, after a while, I decided the square pieces are for other people who want to share with me as a piece for peace. And me, I come home, and I cut other rectangles and start to stitch again. At the beginning, I start again to draw Iraq map just to give me the energy to push me to do more squares. Then after that, I started to write city of Iraqs because many things, many areas started to destroyed and many people move from area to area, they not know, maybe, the new generation they forget these names, and then I put some pictures which I collected before, about historical, religious, religions earlier, and er singers, old singers from Iraq, there is old stamps about Iraq, and er, also the lion of Babylon, Al Basra, this all historical area, and what we used, like some er design, traditional, old cloth from Iraq, from the museum of Iraq what I can find, I can put it in the, in this wall hanging. I thought, maybe something it will change sooner, and I stopped, but it seems the situation become very bad between all this most, all the last ten years, I stopped, then I continue, I stop then I continue, until this January, I said that is enough. And er, as the end, I, I wrote ‘around ten years ago I started to work on this wall hanging about six month ago I saw how Iraq changed so dramatically for worse, that is why I can’t continue to add to this hanging. I thought I would end it one day with a beautiful Iraq but sadly this is unlikely. I left Iraq when I was 28 years old when people didn’t ask each other about faith, I studied in a mixed university and after that I worked in a mixed school, I never wore a hijab, my parents never told me to wear it, I am grateful for the education and morals my parents give me. Najlaa Khalil, January 2015’. AS: So, you said then, that other people had given you squares, [NK: Yes] and they are part of a separate piece of work? 0:06:49 NK: Yes, a separate wall hanging, yes. and I show you, and er, also the other one from different people, some people I not know them, they just send me the squares, some from aboard, Greece, Czech Republic, Australia, and also around Britain. And many people, they promise me, and they want to see it, to contribute. NK: Yeah, and I show both wall hangings around Southwark, here, because of where I live, and especially International Women’s Week they do a big celebration and they ask me to put it in the exhibitions. NK: Both of them, yes. AS: So how do people react to this quilt? NK: At the beginning, surprised, and some people they say, wow how lovely this, and they stand in front of the wall hanging and read, and I always ask them, ‘please anything you want why I put this piece, what mean this, just ask me’, and er they all, ‘yeah this very nice, this is very great, we wish to contribute, yeah, to this project’, and this, all the fabric, all anything from me, nobody tell me, I buy it and give it to them. AS: You said how at the beginning it was quite traditional quilt techniques, but as you went on the way you were making it changed. NK: Yes, yeah, it changed because I want something to be happy news, I not find any happy news, but when I saw the pictures daily in the news in Arabic news or British news or any other news, and I feel so upset, I can’t do anything else. How, how can I see the children crying or killing to produce another piece of art or embroidery, it’s very, very hard for me. AS: so you took, these pictures have come out of newspapers, and then how have you turned them into the quilt? NK: Yes, I use my way for creating yeah, these pieces I photocopy them and er, record everything with me, and I tried here to stitch all these pictures on this quilt. AS: And the colours change as you go through, did you decide that? NK: Yes, because at the beginning I did fabric paint, [crinkling noise in background] and I did silk paint and after that because it’s not continue, I started to use any fabric I have, and to add more to this wall hanging. AS: They seem to get darker and darker as well. NK: Yes, yes, because the situation it seems no light and no end to the situation, yeah. AS: And you have here, the marshes and there’s another picture of the marshes. NK: Yes, sometimes what I find sometimes I find it in magazines, books, history books, and I quickly photocopy them and I keep them. AS: Are these places that you remember when you grew up in Iraq? NK: I grew up in Babylon [noise of cuckoo clock] and I grow in Babylon and as a historical city and we used, I used here, I remember and we go for, for school trip, for any celebration, any holiday, we play in Babylon and er with the… and I, miss this area, yeah, I miss this, where we used to play there and we have picnic there, and buses easy to go just half an hour from the centre of city of Hillah, which is Babylon, and we love it. AS: Could you describe these blocks, these squares here? NK: Yeah, this is silk painting about the gate, door, Ishtar Gate, and this is just about what is the traditional, the palm tree, I miss it a lot, and with the date, the palm tree everywhere in Iraq we sit underneath to keep away from the sun, and the boat, the small boat take us from side to side in addition to the bridges [looking at quilt]. This is also all the stamps from Iraq, and I think no more from these stamps. NK: Maybe in the sixties or seventies, yeah this is the stamps. Now we have received letters and all the stamps very light, seemed photocopy or something else. AS: Oh really, so there’s no post now? NK: No, not many, no. AS: Do you have family still in Iraq? NK: Er, cousins, yes yeah. AS: When was the last time you were there? AS: Oh really, so when you left, you never went back? AS: So through pictures like this, and in the news is how you experienced Iraq, this is how you can see it? NK: Yes, yes. Yeah, I surprised as how the schools change, er, every… this is the teacher union identity card from 1958, which was belonged to my mother, yes yeah, and they send it to me after, er before two years ago, and er, I can’t imagine, yeah. AS: Why did you put that in the quilt? NK: We used to have a big house and as a child what I remembered all this time when we play and laugh and everything, and neighbours and our road, our street, yeah. And I still remember the neighbours, who was in this house, who was in this house. AS: As you’ve put that next to this square here which seems really expressive [block containing photograph of her family home is next to a block featuring the word ‘why?’] . NK: Yes, because when I started I just start to see what I got every day, every week, and this come near to this – why, why, violent, and suicide, and explosions, mortar attack which is make me very sad. And this is Kurdistan north of Iraq, and it’s a lovely place, where’s [there is] the mountains and the weather is nice during the summer, and I went in honeymoon in Kurdistan north of Iraq, and er, yeah. NK: Yeah, because I thought something it will change. About the Dr Naziha al-Dulaimi she is the first women minister in Iraq, 1959. And er, we used to have mixed everything, and er, but now everything changed backward. AS: It says here, after four, could you read that? NK: Okay, I start? Yeah. This is about Dr Naziha al-Dulaimi, the first minister in Iraq and the Middle East in 1959, and I er, a woman write call Yena Mohammed, I don’t know who is she. She write ‘after four years of occupation of Iraq turned from a moderate country of educated and working women into a divided land of Islamic and ethnic warlords who compete in cancelling women from the social realm. Millions of women’s destinies are wasted between the destructive US war machine and the different kinds of Islamic rule who have turned women into a helpless black object of no will or worth’. [Looking at quilt] This is a statue in Baghdad called Kahramana and the Forty Thieves of Baghdad an old story about from Iraq, they said many of them they stolen, broken, or maybe they remove the statue of the women because its women not allowed. AS: What’s this here? Could you say about this one? NK: This about civilian death from January 2003 to December 2009, and you see the figures of the death [dead]. AS: So you’ve put here each square has a date, have you taken from news? NK: This one, November 2009, yes. AS: From a news website or newspaper or something? NK: Sometime website, sometime from the newspapers, yeah. NK: Just for the sadness of what’s going on. This about poem how Iraq before now has become worse, called Kana mouteny, that is ‘Before is My Country’ [Iraqi national anthem after the 2003 invasion] there. AS: Is it an old poem? AS: Can you read it? NK: In Arabic? This how they change it to worse, they change it, yeah, and erm, about how the people now just, er, I, read it? AS: Is it like a paraffin stove? NK: Something, yes, and we used to gather in the winter time around it, watching the TV or reading, or do our homework, and before we sleep we take it, we have another one we take it to other room to make it warm, and then before the last person to sleep they must switch it off [cough]. Oh what else? This also a poem from about Iraq, and called [reads in Arabic, poem by Badr Shakir Al-Sayyab] means, about the sun is beautiful in my country, never mind if it’s dark. Also the dark is very beautiful and nice in Iraq. He dead [died] before 50 years ago but still his poem everywhere. [Looking at another block] This after the occupation we see this different of pictures, the women just sit like this while somebody push them as transport. Um, we saw these pictures on… we say, ‘what is that, that is Israeli?’ The women teach them and they teach them they become police women in Iraq with these um… [Noise of moving quilt] This like cartoonist, about Iraq different cartoonist, in Arabic language. Very good, so have cartoonist, cartoonist. AS: Where did these come from? NK: Sometime also from Arabic newspaper. AS: So you get them delivered to you? NK: No, sometime I read them on the internet, or sometimes friend they send it to me because they know I am interest in these. AS: What’s the jokes on these cartoons? NK: Which one? This one, er [picture of woman holding tray with tea pot and beaker, while man is sitting on a rug], this wife tell her husband, ‘why are you just sit down without work, not do anything just sit, go and become MP in the parliament’, [laughter] because everybody can do. AS: Just a free for all? NK: Yeah. Yeah. And here they say, also, in Tunisia they want new government, in Egypt they want new president. In Iraq they want electricity. Also our demonstration, they said different from other people, we just want electricity. AS: What’s this here [pointing to another picture]? AS: What did you think about that? NK: This one? I shocked, because many people maybe they went and they give them money and many people they not rich. AS No, and the people are so desperate if they have to. NK: Yes, many people felt to go abroad. NK: This, they surprised, [photograph of donkey being scanned with an explosives detector] they said, ‘oh’, they also the donkey become as a terrorist and they search if anything, somebody hides something. This a mosque called, in Baghdad, a big one, Al-Kilani mosque and it’s still until now. This er 38 weapon, over Baghdad in 10 January 2008, and they said it is the Islamic New Year, this is the present to the people when they bomb them. AS: From who, the Americans? NK: The Americans, yeah, this is when they come the American and search the houses, they say all the women sit on the side, frightened. There is another picture, a shocking one, a child. This is the Atlas used in the primary school, yeah. AS: Do you remember that? NK: No, no they are different places, and I remember yeah this one. This is the Iraqi airline in the 60s and all short. This is first car in Baghdad 1908. NK: This is flooding in Iraq in 2012, it become like this, the street, nobody care. And this a baby boy, new arrival. AS: Do you know these? AS: Why did you chose to include those pictures? NK: No, I just, I thought maybe something happy, something, or traditional, er Kurdish dress, yeah, something for change. AS: That life is going on. NK: Yeah, yeah, to them their life going on, and sometime you can see in the news explosion, and we get worried, oh which area which area? I go and search, on the satellite, what area? and the people they say, what we can do, it just become normal to see the bodies in the streets and explosion in the area, and if we call, ‘are you ok?’ They say, ‘yes, yeah we used to, don’t worry’. Yeah. Oh dear, what else? Something… this er, spiritual, of Shia, yes, and Kabul. This is what he buy he sell in the street and we eat it, and no problem at all, yeah, mm. NK: This also a poem which mean Baghdad tired from the blood cloth [reads in Arabic poem by Adeb Kamal Al Dee]… that is mean Baghdad very tired from the blood cloth, tired and decried and when they want water they give them a bomb, a bomb. And when they give her, just, they want bread, they give them swords, yeah, to kill, yeah. AS: It’s next to this big picture [NK: Yeah]. You said you started then you stopped with this and then you carried on. Did you feel like you just had to keep going? NK: I thought sometime yeah when I thought no, I want to do this, or I remember this, I do this, yeah then yes yeah I want yeah, then but this month I said no, I must decided enough is enough. AS: And have you been sewing it together as you’ve gone along? NK: Yes, yeah, when become in each row I have seven in each row, when become seven I stitch them together and I add it, yeah, between time to time. AS: Do you think… you’ve said there’s a narrative because of the real time that’s it’s taken you, here it’s so, such an amazing work of history, because you’ve got things that are happening now, interleaved with your memories, it’s amazing. NK: Thank you, thank you very much yeah. This is also history, yeah, from history yeah. Then have, I surprised when they say they published new books, and they can’t write Iraq in Arabic very good, I don’t know who published it, yeah, but I received this by internet. 0:34:40 NK: They put Iraq, when they write it in Arabic, they make mistake, mistake on the cover of their book. NK: And nobody correct it. Yeah, and somebody send to me this one. AS: Is this it here? NK: Yeah, and they put around it. Yeah, the Republic of Iraq, but they put it Republic of Arrq. AS: What did you think about that? Why did that shock you? NK: Yeah, because how they publish a books for the, I think primary school, or secondary school, and nobody check the spelling. What kind of education? Yeah. Yeah nobody edit, or check, or no. This a collection of match boxes, yeah. [Pauses while looking at the quilt] And this in 2012 he take his sister to school. NK: Yeah. [Pauses while looking at quilt] This about the children and UNICEF estimate 2 million children in Iraq continue to face threats included poor nutrition, disease and interrupted education. AS: You were teacher in Iraq? AS: What did you teach? NK: I teach math and physics, and er, but I like the embroidery when I am in the primary school, but I study science and that is why I went to physics, and I work three years in Iraq, yeah, and in a mixed school, mixed atmosphere, mixed students, then after that we left Iraq we went to Algeria, and I work in Algeria also, seven years as a teacher in secondary school for physics and chemistry then after that we came to Britain. AS: Did you work when you came here? NK: When I came here I want to return back to teach, but er, one of the colleges they give me the wrong advice when I went, I ask, I want to go back to teaching, they say no you must pay £2000 a term a be a maths teacher, while the country need, they have short in math. And then I said no, my children young, and where I leave them, and how I can pay this amount of money, I stopped. But after that I saw this advice is wrong, and I went to do a course just in adult education, and I did the adult education courses, and after that I did math teacher in some places. Then they ask me one day to teach embroidery or Arabic, or I did embroidery and Arabic. Then later on, after this, become more opportunity to work as a craft tutor more than math, and I started to forget the math, and sometime before four years ago I applied the last time to be a math tutor for adult education just for beginner, but the interview after that, they said no. I said why, give me the feedback, they said no because you did craft and handicraft embroidery more than the math, I said this is what opportunity I got, I stop now looking for math. [AS: Oh really.] Sometime I miss it, sometime I say oh I wish, sometime I miss it. AS: Mm [cuckoo clock and laughter] that’s nice. Have you ever seen any other quilt like this? NK: No, no I don’t know if anybody did, I don’t know. AS: Where did the idea come from? That this is what you wanted to? NK: I just wanted to make maybe one metre by one metre long maybe something about Iraq or historical city or maybe something about Babylon especially, and then it became like this, it ended like this. AS: Is this very different from the other types of embroidery that you’ve done in the past or the embroidery that you teach? NK: Yes, when I teach just the for beginner, or sometime they are good but they need some help how to finish a project. I can teach knitting and crochet, and still until now I teach knitting and crochet and embroidery; how to start, how to finish something. Sometimes I do silk paint, sometimes weaving for beginner, and er I enjoy it, I enjoy it. AS: Did you enjoy those things when you were young? AS: Did you do it with your family? NK: Me, I am just the only girl and with other four brothers and my mother just in holiday she teach me some embroidery stitches and I used to work pillowcases, cushions, bedsheets, bed separates, and I love it. And in primary school they took my work for exhibitions always, and after I finish the primary school, the teacher she come to my mother in the first year of secondary, and she ask if Najlaa did anything new to put it in our exhibition. And I used to love and relax and enjoy it too much, and my mother she used to have a wooden box of a collection of transfers, I don’t know maybe from last century or century before, I don’t know how she got this collection and I don’t know where that happened now, where that collection go, went to which family, and I just look through and I wish I had no homework to do all this, and I used to go secretly to her box, and I look through, ‘oh one day I do this, one day I do this’, it was lovely, lovely collection. AS: What they ? Transfers, what’s that? NK: A lot of transfers, er, cross stitch and also transfer for hand embroidery and mainly hand embroidery. AS: Are they shapes and patterns? NK: Yes, and she used to put carbon underneath and transfer the design on fabric. Yeah. And also she teach me the first, how to knit, the knitting, yeah, she teach me how. Yeah. AS: But you went to university and did maths and physics. What that usual for woman? NK: Yes, yeah any subject you like to do, maybe I thought about art, to study art or journalism at that time, but then they said, no it is very hard, you must be I think in political party or the party you have the job to do, you can’t study, just study for, you have to belong to a party at that time. NK: For journalism it is hard also, yes, yeah. mm. Then, because I study the science, scientist, I continue with the physics. At the beginning I not like it too much but after that, there was no way, you finish it, yeah. AS: But, all this, it seems like, this quilt is more about storytelling and recording than that enjoyment of the making. Did you enjoy making this? NK: At the beginning, between yes and no. It has given me something that I did something or I record something about, about Iraq, yeah. That is why I said, something, memory of Iraq yeah, mm. AS: Did you feel like it gave you something to do? As a response? NK: Yes, yes. At least something to represent Iraq I don’t know where this quilt will end, but at least I did something, make me proud what I did. AS: When you’ve shown it to people in exhibitions, how have you done that? Have you hung it up? NK: Yes yeah, after the first time was around 1m and half, it was okay, I put at the top, like this with a stick, and I put it hanging, and the people can read. And then when become too long, we put it on a board, and then on the floor and stop the people go around and read about it. AS: When was the last time you showed it? NK: The last time I show, last year in Imperial College, in London, they did Iraqi day and the student, erm, they want to make and somebody tell them there is, or advertised in the, and somebody in Iraqi community and they send me the email, ‘do you have something to share?’, and I did. And they did five years, every year in February or January, they did one day evening about Iraq, open, everybody can come and free entry, and they surprised to see this piece, when at the beginning I tell them just want a board or two boards and something, they not understand what I mean, until they see and they say ‘Ah okay’ and they hurry and they bring me the board and I arrange it. AS: And what’s the reaction, you said people look, are they…? NK: Yeah they are surprised they say, ‘did you make it? Did you make it?’ I said ‘yes, I made it’, and they said ‘oh thank you that is good, you must take it to galleries you must take it to the museum, and let them, and show them what this is about’, I said ‘yes, yes of course’, I wish that, to see, more people to see what this is about. AS: Do you feel like you’ve done something exceptional? 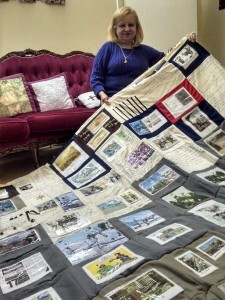 AS: The thing about quilts is they bring together so many different things, don’t they? NK: Yes, yes, and sometime people say ‘oh we live in this area or we saw this area’, and they say ‘oh it’s very good to make this, how you make it? And yeah, did you have fund for this?’ and I say ‘no, no it’s just my personal, I started, I like to do it, and I yeah, and I want to do this one, yeah’. I proud to do this, yeah. AS: Hessian here, why did you choose that? NK: No, I just have the fabric and I said ‘oh let me do this one, yeah’. [Whispered] do you want to speak about the other one? AS: Yeah, do you want to? Yeah [sounds of Najlaa unfolding the Peace quilt]. NK: And er, yeah, as I told you, when I started I cut squares of fabric and er… as I told you before, when I started I cut squares of fabric to do, the hanging, the main hanging for me, I started with Iraq map, but I couldn’t, and I abandoned. That is why some people, they said ‘no, give it to us and we do a square for you about peace’. And I said, ‘any message, if you can’t embroidery, if you can’t quilt, just write to me anything you want just for peace only’. And I received the first pieces, and I shocked, and this gave me the energy to continue with my wall hanging. This is from different people, some of them I don’t know who are they, this one, one lady she always ask me, and because when invasion happen my brother’s in Iraq and I not know whether he alive or dead, and she printed, she took my photo, and she said ‘from Baghdad one word is better than silence’. I said to her, ‘I call, I call’, I can’t, there is no phone, no letters, nothing’. AS: Where is he now? NK: Yeah, one young girl and she said, ‘no, I must do something’, yeah. And each person, this all people, some, many of them I not know them, from a friend to friend and they send to me. AS: So how does that, erm, how do you feel about these? NK: Of course, sometime I shocked when I receive it, and I said ‘oh’, sometime they stopped they look to me they say ‘no, we not do’, and I say, ‘no, just for peace’, there’s nothing, yeah. AS: And it’s not just about Iraq, it’s about peace of all different. NK: And this one lady, she put elephant, and I said to her, ‘why elephant’, in Iraq no elephant, and she said ‘no, the elephant not forget’, that is why in her mind, to draw the elephant. And er, some people just Iraq, erm. Yeah, you can see its different, different stitches, different groups. AS: And how did you meet these people, through friends? NK: Some people, no, some people they say, some people I don’t know who are they. AS: Is it when you show your quilt? How did you give them the square? NK: Er, sometime when I said, ‘anybody want’, sometime, quickly people take the square and they say we want to share, why not? NK: Yes, sometime they take it and they not give it me back, many people, a lot. Now I sometime I stopped, yeah, just six inch by six inch, and sometime they say, ‘no send us, we’re a group of embroidery’, those people I don’t know who they are up til now. See once they email me and they said ‘give us your address please we have pieces’, and I don’t know, until now, I don’t know who are those people. AS: What do you think about that? NK: [Looking at embroidery of the Hanging Gardens of Babylon] I, of course, the hanging garden of Babylon, and I said ‘wow, yeah’, between tears and yeah, and I said ‘wow who is this?’ Until now I don’t know, who are they? Yeah, also her from a textile group I don’t know who are they. AS: Oh they made these? all this row? NK: They said to me ‘give us the square its better’, and I send it to them and they did, yeah. AS: Beautiful, the hands here it’s beautiful. AS: This one from Vietnam. AS: And this is African cloth. NK: African, yeah, this lady came to my workshop just once and I said, ‘oh I talked to other about the piece’ and she said ‘give it to me please’ and she send, and I not know her. AS: So do you exhibit this – wow look with the sequins. So do you exhibit this one next to this one? NK: Yeah, and I explain to them, this is my wall hanging, this is a group, any person can share. AS: Do you feel like this one will continue now? NK: Sometimes I write to them, because I can’t give my address to anybody, and sometimes they send to me, yeah. [Long pause] Yeah, this was the last one, last month, one lady she do printing, she know a little bit about Iraqi and she write ’peace to Iraq’. AS: So did you not make any of these? AS: How do you feel that you are at the centre of this? NK: Yes, yeah, this one of course, yeah, I love it and I admire it, yeah, because sometimes, yeah when they bring me to the, where I teach or, somebody they send it to other person and they say Najlaa this is for you, what is – and then I forget about it and I say wow, yeah, I, showed to others ‘look what I received here today’, it make me very emotional, yeah, and this, also a young girl in Imperial College, she show, and she took the fabric and after a year she came again waiting for me, to see if I am here or no, and to give to me the piece and I surprised and she said ‘yeah I took it from you and I looking ‘where is she, where is she?” and I say ‘wow’ and she put er, the sequins also, it’s about Sinbad, Sinbad, in Iraq. Yeah, and she stitch it, and she draw, and she paint it. Then I know it is not er, I try to put it on a piece of fabric again, and I said to them many people they stretch or small, I say don’t worry I put it on another piece. [Pause]. AS: Do you include every one that you get? NK: Thank you, thank you. AS: There’s so many people. NK: I say don’t worry because they say oh we can’t stitch, I say no, don’t, you can’t stitch just write poem something just for peace only. I not work any. AS: How many squares are there? There are seven across. NK: Seven in each row, [pause while counting rows] 19 times seven. NK: And I’m looking for more, yeah. This lady is from The Quilters’ Guild once I took this to Quilters’ Guild meeting just this one because I can’t carry both on transport… and she said, ‘oh I make one for you’, and quickly after ten days she send it to me. [Shows a block with a white flower in the centre, where it says ‘peace’, underneath the flower it says ‘peace pledge union’]. AS: It’s a very powerful thing that you’re doing. NK: Thank you, thank you Alice. [Long pause]. AS: Do you have, what’s your next plan to show this? NK: Until now, no, but if any group, sometime I write to museums and galleries, but maybe they not understand what I talk about, maybe. AS: Do you send photos? Of what it is? NK: No, no, I just say that I have two wall hangings about peace and Iraq if anybody interest, but because I not get a reply, I have no publicity that is really good for this, and of course I wish more people they know about it, but just once I wrote to the Quilting magazine in 2009 and they publish it, in the magazine, I have a copy, yeah. AS: As well as these two quilts, which are big projects and long term projects, do you make other quilts as well? NK: Yes, yes between embroidery and between quilting, and this one, this one, and this one, and I [pointing around the room] have other quilts. AS: And you belong to a group? AS: And what does that involve, belonging to The Guild? NK: To The Guild of course they send to us the news, quilt, every three months, receive magazine and regional day, what is the news, what is the exhibitions, you see new article, what is new publication, and I like it, yeah. Sometimes I can’t attend all the exhibitions or the lectures, or, I wish I had time and go, I wish to learn more about quilts, yeah. AS I think that what you are doing with these is very outward looking to the world and you are making a difference to the world through quiltmaking. NK: Yes, of course yeah it’s something different yeah [long pause]. AS: Where do you buy all your fabric from? NK: Any fabric shop. Sometimes in the exhibitions and the fairs, where I go, because that’s my interest, and I, I buy. AS: Do you like the fairs? Which ones do you go to? AS: Do you enjoy them? [NK: Yes, yeah.] What do you like about it? NK: You see, I like the creative things, yeah, and additional to traditional, and to see what is the news, and what is any new thing coming into the market, the creative idea, and I wish I have more time to do more creative, yeah. NK: So much, and the internet and the websites and I love it and you can see my shelves are all about embroidery and quilting there, embroidery, many folders. I sometimes print a lot from the websites also to read about it, yeah and this is, this give me a pleasure and some happiness. AS: And you have a blog as well which I’ve seen, how did that come about? NK: Er, the blog after I read many blogs, and I said, I have many things to write about, and let me start something, and with the encouragement to my daughter ‘please mum help me, please mum help me’ how I start, how I do, she is always help me with the grammar, especially, yeah, and I write it and I prepare everything to her, and ‘please mum help me’ I want to do this one and this one here and that is why I started, I say no. I go some time to different places that people they not know about it, and many people when they read it they say oh we like your going out and about we like to see [sound of cuckoo clock] these places you give us idea about it. And I like always camera and take photos, and sometime I develop these photos and I look between time to time, not just in front of the computer, and I like to go any time I am free or, I just want to go out, I go to galleries and museums, and to see what is going on, not just textile of course the textile the main thing, but also I go to other galleries. AS: Do you feel that… Have you written about this on your blog at all? NK: I wrote just small because, er, I said maybe the people thought this is just political, political, but this yeah, but I mention sometime, last year when I put it in Imperial College. I put, I say, I attend and I put a photograph of how big the quilt. AS: So this one is called Piece of Peace. And what’s the other one? NK: They are both of them I said Pieces for Peace. Yeah. AS: Shall I start taking some photographs, yeah? And I then I can probably ask you more questions as we go through. AS: How do you want to fold? NK: You want this or this? AS: Shall I do this one first because it’s on top? NK: [Laughing] let us take to this one, because it’s the biggest one and I move.